Do you love cool design in housewares, clothing, and gifts, but can’t afford the price tag? Download Fab’s iPhone, iPod Touch, and iPad app to stay up to date with the latest sales and promotions to bring more fabulous to your life. 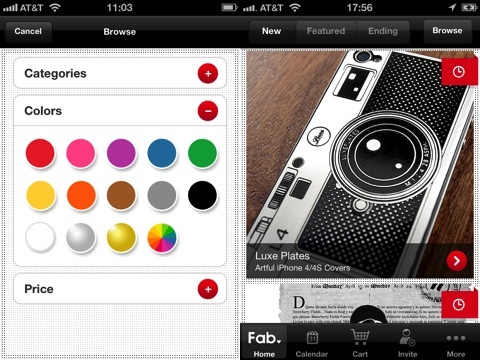 The Fab iPhone app navigation and interface are visually striking and intuitive. You move through the Fab iOS shopping app with the help of a familiar, well-defined bottom menu bar. The home screen is a Pinterest-like feed of the featured sales. A sale could simply be a product, or it could be multiple products available from a designer, store, or online retailer. Each sale has a small red clock icon at the top right. With a touch, the countdown until the sale ends extends over the photo. If you want to check out sales in greater detail, you press the forward icon at the bottom of the photo. If there are multiple products in a sale, then a grid of thumbnail images is available for you to scroll through vertically with responsive gesture controls. For each product available, there is detailed and attractive information below each item. You can add the item to your shopping cart, and you can continue browsing. Another neat navigation feature of the home screen is the ability to filter with one touch the newest, featured, and ending sales. You can check out Fab iOS shopping app sales by the calendar icon. Sales are launched at specific times of the day, and you can also scroll through to find out about upcoming sales and product information. There is clearly demand for these items, as items are only reserved in your shopping cart for 15 minutes. There is a countdown clock to remind you to complete your purchase at the top of your Fab screen. Secure payment is provided within the Fab iOS app by Braintree with clear, easy interface. The Fab iOS shopping app also incorporates some cool social networking features. You can share a product to Facebook and Twitter, as well as email and SMS text message. If you invite friends to Fab, then you earn cash to buy more fabulous products for your dog, home, pantry, kids, and significant other. The Fab iPhone, iPod Touch, and iPad app brings great design and great deals together with a brighter, more spirited graphic vibe than Gilt Groupe’s iOS app. Shoppers will find a new addiction in Fab’s free download from the iTunes app store. 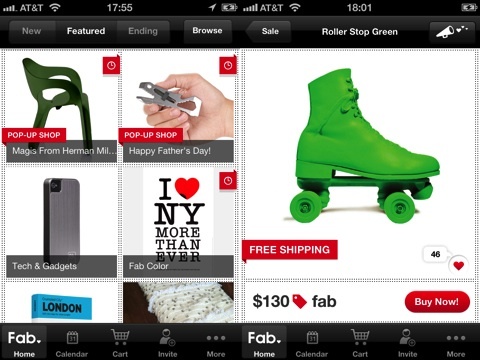 AppSafari review of Fab.com was written by Jenni Ward on June 25th, 2012 and categorized under App Store, iPad apps, Shopping, Universal. Page viewed 4271 times, 1 so far today. Need help on using these apps? Please read the Help Page.